The Chanukah decorations are all out inside our home. The lights are ready to be lit tonight on the first night of the holiday. The table is adorned with menorahs both old and new, passed down from loved ones and bought along the way, a slew of dreidels to spin and play games with, and arts and crafts projects to create and enthuse, as we begin to celebrate. Getting this all set up has become a favorite pastime for Sarah and me each year. She gets so excited when I bring out the bin with our growing collection of old and new keepsakes, and traditions for her to see and follow. We have a new addition to family holiday and traditions. His name is George -- a.k.a. Mr. G. He’s our mensch who came on a bench and who has been appearing and disappearing all around our home making us all smile. George can be held and hugged. We encourage it. He watches out for us but not to see whether we are good or bad. Instead, he is just there to be part of our family tradition. He brings an element of fun and surprise to the holiday. 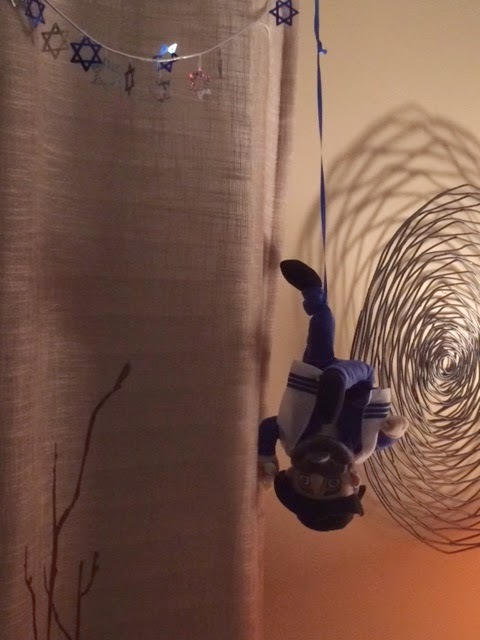 Just the other day he was up to no good, as you can see here, and hanging around. He also likes to eat a lot. He recently got stuck in the bread box and the refrigerator door. As parents, it's our job to help guide our children, especially as far as teaching them about religion and spiritual beliefs. 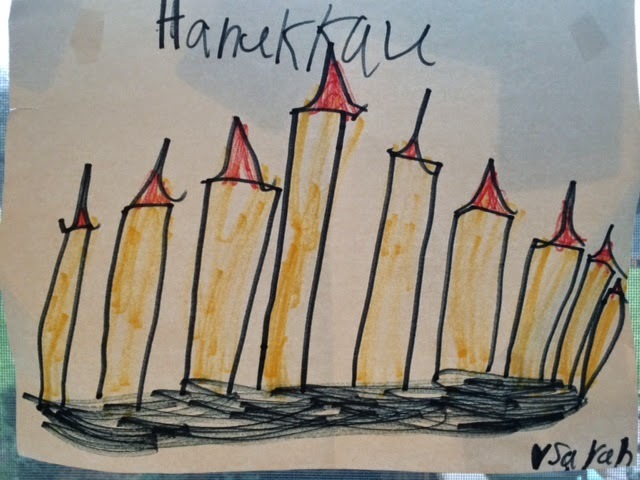 Therefore, when Hanukkah comes around for us, especially as my daughter starts to gain a better understanding of this holiday, it seems as if more needs to be done on my part, and her daddy’s, to help her see its true value and meaning, especially beyond the gifts and glitz and commercialization around us. I admit that I often go a bit over on presents. However, one thing is true, I never lose sight of doing what we can to help others. And, that selfless act of kindness is what I continue to teach Sarah day in and day out. Last year, Sarah agreed to give up one night of her presents and to pick something out to donate to a child in need through the Toys for Tots program. This year, when that discussion came up through a friend helping out a specific family in need, Sarah decided that she wanted to give up not just one but instead, two nights of her gifts, for a boy and a girl. Together we picked out the gifts that we donated. I am so proud of Sarah and feel that it’s never too early to teach our children to give back and help others. In Hebrew, this is Tzedakah, helping others. 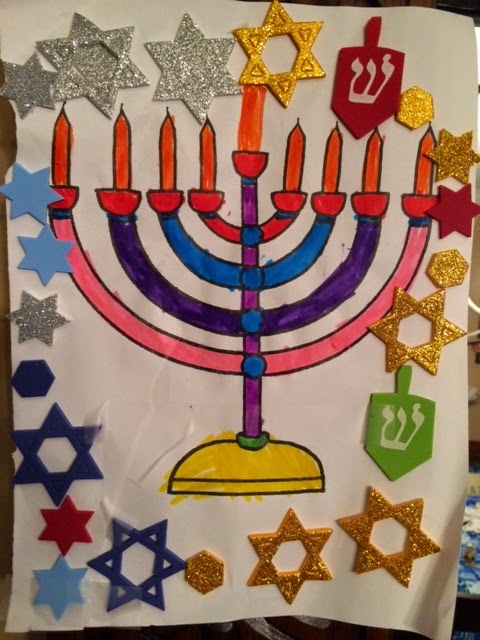 So, as the lights burn starting over the next eight nights, dreidels spin, fried food being eaten, and time is spent with loved ones, let's be reminded of the efforts made in our history to create the freedom we now experience today. And, let's celebrate with the lights of the candles as they flicker and be reminiscent of what has been done for us, and what we need to do moving forward to help others.